Guest-blogger Colin Palmer’s blasé account of his Channel-swim preparations disguises the fact that he is a man of steel and one of the wild swimming élite – none of which could be guessed from his amiable appearance and manner. Whatever exotic location I think of to swim, I find that he has preceded me, though not if there is any risk of an ‘instant ice-cream headache’. Colin tells me that cross-Channel swimming is firmly discouraged by the French authorities, and exhausted swimmers are liable to arrest when they step ashore. 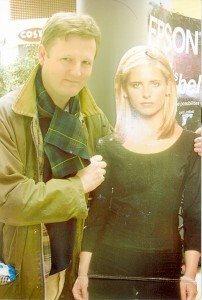 Not the sort of man to be put off by foreign pettifoggery, Colin is undaunted and valiantly supporting a worthy cause. From Soho down to Brighton I must have swum them all. I did not realise that signing up for an English Channel Relay swim would quite take over my life in such a major way. I haven’t quite swum in every pool, lido, river and lake between the aforementioned Soho and Brighton but it is beginning to seem like it. Although Tadley is my default pool where I often talk swimming to Rupert, every trip away from Berkshire means scouring the internet looking for new challenges, places and people to swim with. I am undertaking the challenge with Aspire, the Charity that works with people with spinal chord injuries, and so I have a ready body of team members (Aspire has five teams of six people doing the Channel this year) to swim with. So far our location of choice has been London Fields Lido, a hidden jewel deep in the heart of Hackney. The fact that the lido is heated and open all year is its great appeal, but the after-swim coffee and chat at the Hoxton Beach Cafe – you will detect the irony if you have spent any time in East London – are well worth the trip into London. The Soho link is my solitary training trip to the Oasis pool in Endell Street,Central London, more Covent Garden really but close enough to use Pete Townsend’s lyrics, and Brighton will be our weekend’s cold water acclimatisation in the sea in early May. I have already managed some early cold water acclimatisation when joining the massed ranks of the South Wales section of the Outdoor Swimming Society (three hardy souls) last Sunday (27th March) at Caswell Bay on the Gower peninsula. Although the calves froze on impact with the sea, after a while it became fairly comfortable. Front crawl was impossible however due to the face freezing on contact with the water, creating an instant ice cream headache. Feeling good I saw off a couple of the experienced hands and managed a creditable 25 minutes immersion. It was not until out of the sea and the onset of uncontrollable convulsive shivering whilst changing that I realised the wisdom of experience, as the old hands were able to chat and drink coffee in the beach side cafe whilst I shook quietly in the corner. A thirty minute drive with the heater on full blast did the trick and thawed me out before Sunday lunch and had me looking at the calendar for the next chance of a weekend swim in Wales. This weekend I am aiming to take my first dip in the Thames, a 1/2 mile section in Goring, one of the many stretches I hope to do in the following months (I am sure David Walliams must have overheard my plans). Next week I am in Cluj, Rumania, and so I am working out how I can access the University’s 50-metre pool. What is Rumanian for ‘must I wear a swim hat?’. I will be in Cologne over Easter so I have to check the temperature of the Liblar See (an old quarry) and whether or not the owner of the campsite will let me swim in her lake. She looks at me very strangely when I turn up in the middle of summer and and so my appearance in April will lead to much wailing and gnashing of teeth. Unfortunately my limited German, ‘ein Bier und ein Käsebrötchen mit Zwiebeln’, is of little help at such times. Later in the Summer I will have the joy of two weekends’ swimming in Dover Docks, with real Channel swimmers, before the big day in July – August. As you can see I am looking for tips for interesting places to swim and people to swim with so if you fancy a dip, or maybe just a walk along the towpath when I am doing a section of the Thames, drop me an email. I am more than willing to share the fun. If you are interested in helping Aspire then you can donate through my website http://www.justgiving.com/Colin-Palmer3. The uniqueness of Rupert Willoughby appears to have been short-lived. Willoughbys are numerous in England, yet none seems ever to have borne so distinctive and euphonious a combination of names. Since the death, last year, of Cleveland Rupert, I proudly bore it alone. All that has changed since the birth, on 23 February 2011, of Rupert James Hugh Willoughby, younger son of James and Lady Cara Willoughby (nee Boyle). James is the grandson of Lord Middleton and Cara is a daughter of the Earl of Cork and Orrery. We belong to different tribes of Willoughbys. Their earliest-known male-line ancestor was William Willoughby of Willoughby-in-the-Marsh, Lincolnshire, in the time of Richard I. Mine was an Elizabethan yeoman, John Wilby of Colchester. 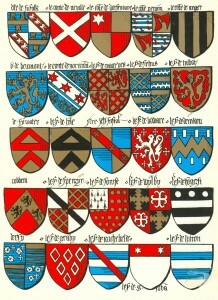 ’Wilby’ was a common variant of ‘Willoughby’: see, for example, the famous MS of the arms of the English nobility, now in the Bibliotheque de l’Arsenal in Paris, where the arms of ‘de Wylby’ depicted (second row from bottom, second from right) are those of the Lincolnshire Willoughbys. 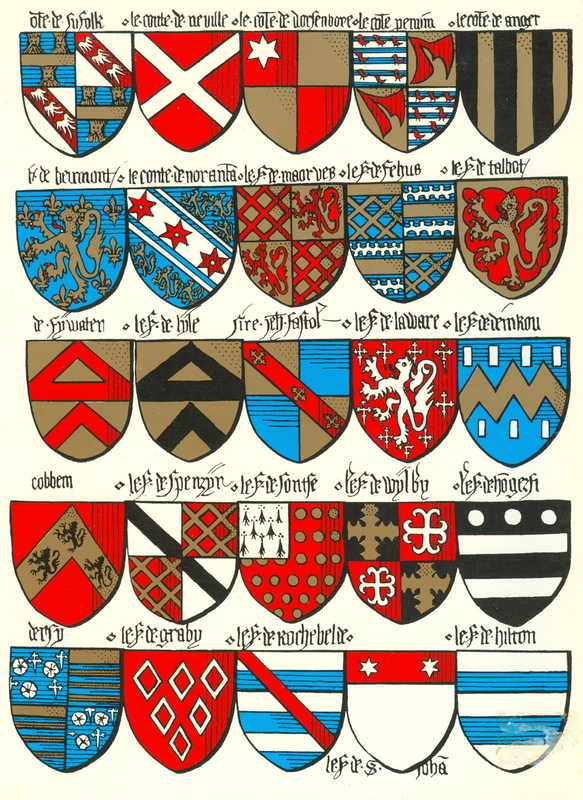 Though these arms were also borne by a George Willoughby who was living at Colchester at the same time as the yeoman John, my stock may just as easily derive from Wilby in Suffolk as from Willoughby in Lincolnshire – not to mention the Wilbys in Norfolk and Northamptonshire whence they might also have come. As all these villages were within the Danelaw, our shared Viking ancestry is, at least, beyond reasonable doubt. The eponymous ‘Willa’ who gave his name to the ‘byr’ or ‘by’ in each of these counties was no doubt some sea-rover or ‘creeker’ who had daringly penetrated far inland, founding the homestead or single farm that had developed, over time, into a village. The movements of these settlers, throughout the British Isles, can be traced very conveniently through the place names that they left behind. My father, Christopher, had many namesakes and was regularly confused in military circles with Brigadier Christopher Willoughby, young Rupert’s great-grand-uncle. However, it is likely to be some time before the lad is lecturing on the Bayeux Tapestry, writing books about Basingstoke or preparing his own website. I am therefore delighted to welcome him into the charmed circle of Rupert Willoughbys.